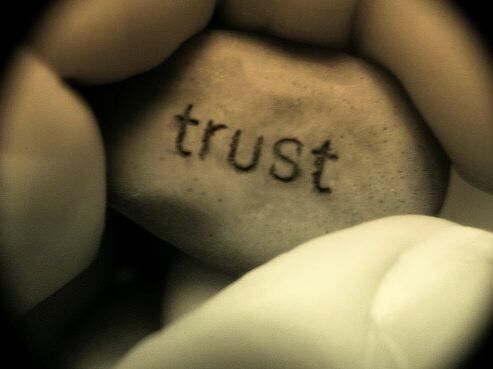 Trust–it is such a small word with such an enormous impact. As children each of us arrives with an internal trust button that is pushed by everything in the world. As we grow older however that button becomes encased in a protective shield and the pushing of it becomes a momentous occasion. Life has a way of giving us a few hard knocks to teach us that trust is something that can bring us wonderful rewards, and also heartbreaking letdowns. When navigating the unchartered waters of fertility we are often asked to trust. At times that trust comes easily, and at other times we find out all too quickly just how misplaced that trust can be. We trust our partners to be there for us no matter what, to see us through all of the hard times, and to love us even when we are unable to provide them with the missing piece to make a family. We trust each doctor, all their recommendations, and the many limitations they tell us our bodies carry along with them. We trust the medications, supplements, and invasive procedures that all promise to usher us into motherhood. We also trust the one thing that is betraying us above all else–our bodies. We trust them to regain their rhythm, to respond to the interventions, and to return to health. So what happens when the trust is broken? What happens when partners can’t be all that we need them to be, when doctors and treatments fail to work–or even make things worse, and when our bodies refuse to conceive? Though a tender heart may cast a vote for this solution, and though a wall erected around the guarded hurt may rally to shut the world out and never trust again, what we must do is trust. Trust is not something that we give to others; trust is something that we give to ourselves. When we place our trust we are placing it in a deep belief in our own strength, in our own perseverance, and in our own ability to get up no matter how hard someone or something knocks us down. A vote of distrust of another is in actuality a vote of distrust in ourselves. We must trust that no matter whom or what lets us down, we will survive. Survival may mean walking away from those people and things that break our trust, yet the one thing we never walk away from is ourselves–trusting that tomorrow will be a brighter day, and that we will survive to see it.